Great taste! 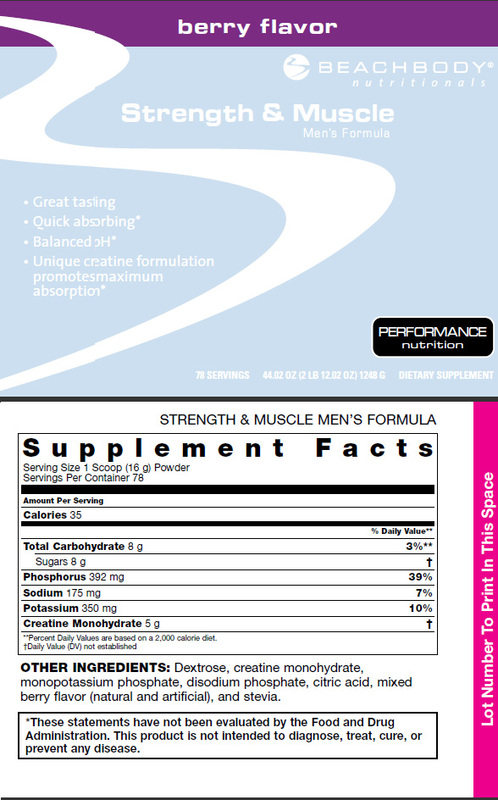 If you've tried creatine formulas in the past, you know how low they can rate on the taste scale. That's why Beachbody made a concentrated effort to offer a flavorful, thirst-quenching product that you'll actually enjoy. Quick absorption. While many creatine products enter the stomach for limited absorption, Strength & Muscle Men's Formula is quickly absorbed into the bloodstream for enhanced results. Balanced pH. A special pH delivery system neutralizes stomach acids to eliminate cramping and stomach upset. No matter what fitness programs or physical activities you enjoy, Strength & Muscle Men's Formula can have a tremendous effect on your ability to achieve greater strength and lean muscle mass. Try it for 30 days and if you're not satisfied within those 30 days, just return it for a full refund of the purchase price, less shipping and handling!